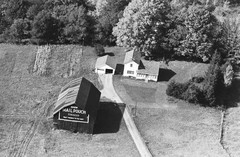 This is a gallery of Vintage Aerial photos of barns or other farm outbuildings sporting painted or shingled advertisements. Not signs about the farm or business located within, but a paid advertisement (usually the payment was solely having the barn/outbuilding painted or roofed for free). These photos are arranged in alphabetical order by county name, then by state, then by year, and finally by roll/frame. 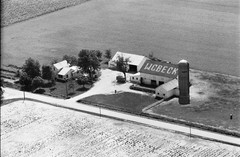 Photos with a green border have been geolocated (see the Vintage Aerial photo page for location information).